As you probably know, I’m not one for the pink party that breast cancer has become, I’d prefer to stay at home and hide rather than confront yet another BCAM (Breast Cancer Awareness Month), and I certainly don’t endorse “Shopping for the Cure.” But I do think this is a good time to share some highlights that have come across my path. 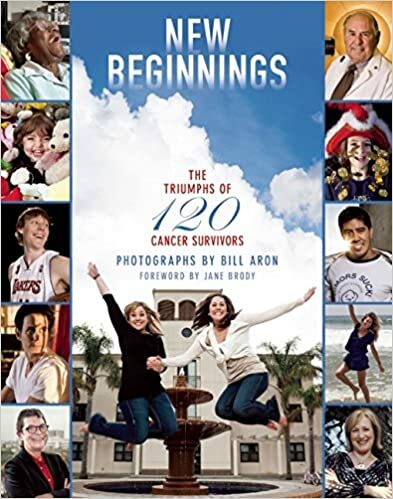 Last year LA-based photographer Bill Aron published his long-awaited New Beginnings: The Triumph of 120 Cancer Survivors. This beautiful photo-journal highlights the inspirational stories of living with and after cancer – stories of hope and aspiration, of joy and even transcendence. I’d urge anyone with cancer to engage with the book. It is available on Amazon and other sites, but is also alive and well on a new blog, where you can share your own story. And you’ll find some familiar faces, too! I Am Anna comes to us from ReThink Breast Cancer and shares the beautiful and heart wrenching story of a young mother seeking to leave her legacy for her husband and young children, while facing the reality of her disease. It may seem like a long video, but if you want to understand living inside the life of this disease, I can’t think of a better film. It’s not easy, but it is powerful, and worth your time. We want the SEER database modified to begin tracking when someone with early stage disease metastasizes, so that every woman and man with metastatic disease is counted. We want additional research funding for all cancer types. The National Institute of Health (NIH) now only funds about 8% of the grant applications it receives. We want that number increased to at least 25%. We want at least 30% of federal breast cancer research dollars to be spent on metastatic disease, with a focus on translational research. If you would like to sign on to their agenda, please consider using this draft letter to contact your members of Congress. We are in dire need of greater awareness, a better understanding of the disease, and more funding for research. So – enough pink – let’s learn and act! This is a beautiful and very moving video. it’s worth watching all of it. I am writing to congress and also trying to get the draft condensed to get more signatures.